Background: Aging affects all aspect of the face, albeit in varying degrees and at different times of life. One of the most disliked aspects of aging in women is the development of vertical lip lines. While typically believed to occur primarily in smokers, there are many women who develop them who are not smokers. And some women do not develop them at all almost regardless of age. Vertical lip lines or rhytids are most prone to occur in Caucasians women who have fair complexions and thinner skin types. These women often have naturally smaller lips which means they have less vermilion show. These thinner lips are more prone to reveal the skin wrinkling effects of the encircling orbicularis muscle. Treatment of small lips that have vertical lines is most frequently done by injectable therapies. The use of injectable fillers for a plumping effect and Botox to reduce muscular contractions to decrease the appearance of lip lines can be effective treatments that have their merits in properly selected patients. But in lips with limited vermilion show and multiple and deep vertical lines, injection therapies will not offer satisfactory improvement. 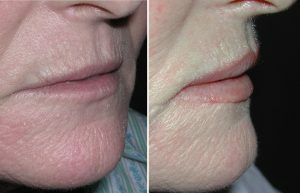 Case Study: This 58 year-old female was bothered by her aging lips that were small and had developed a lot of upper lip vertical lines. She had tried injectable fillers but she did not like the result and it did not improve her lip lines. An upper and lower lip vermilion advancement was planned and marked with a 4mm upper lip advancement and a 3mm lower lip advancement. After the excision of the upper lip skin, a .5mm sheet of Alloderm was placed under the upper lip skin edge as an interface between the skin and the muscle. The vermilion was then advanced and closed to the skin edges to complete the advancements. Her six week result shows increased vermilion show and a marked reduction in her vertical lip lines of the upper lip. This demonstrates that lip advancements, besides making a sustained permanent change in lip size due to vermilion show, is effective at reducing vertical lip lines. 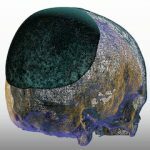 Whether that is due completely to the skin excision or the placement of the dermal graft interface is speculative. 1) Lip advancements are the most powerful of all lip augmentation procedures. 2) A lip advancement changes the size of the whole vermilion from mouth corner to mouth corner. 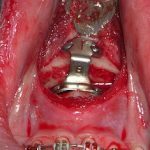 3) A lip advancement can cut out the vertical lip lines that are in the excision areas.